Mugler Summer 2018 Collection We Adore. Women who embody the irresistible, even in the face of danger. These are the heroines of the Mugler Spring Summer 2018 collection, buoyed by an ultra femme energy of romance and sensuality. 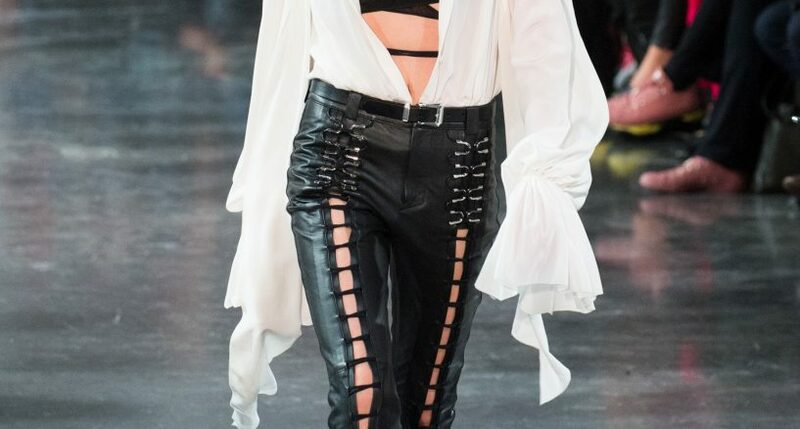 Considering the power of the corset, Koma deconstructs its bold allure, accentuating the waist in topstitch black leather, raw and glazed denim, and whipcord laced suede. Svelte tailoring is cut close – cigarette pants curve into the hip and graphic blazers bear a Mugler signature sculpted shoulder. The palette articulates hot and cold – black and bright white rub against acid yellow, hot coral, desert sand, and a pale liquid blue. Textures follow suit, as exotic snakes inspire second skin appliqués of glossy armoured scales, metal plating, and shimmering embroideries of techno sequins and thread. Wrapped, laced, and gathered, asymmetric gowns twisted in lurex-shot silk and mousseline riff on transparency, injecting the silhouette with an illicit guise of sensuality. They transform the Mugler woman with a new diaphanous elegance. The weaponry of womanhood is at play.